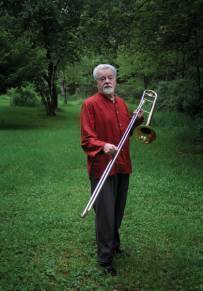 The trombonist Roswell Rudd looked drained as he entered his 82nd birthday party at Dizzy’s Club Coca-Cola in mid-November. Making his way in a wheelchair toward a center table, he still boasted a beautiful shock of white hair, but the cancer he’s been battling for several years now has caught up with him. Sickness is nothing unusual, but merry, mischievous and seemingly irrepressible spirits like Rudd’s certainly are, so what I remember of Rudd threw his current state into sharp, sad relief. But pathos wasn’t the point here. Rather, the mission at hand was similar to that discussed in this month’s cover story, on Arturo O’Farrill and Chucho Valdés’ new collaborative album: celebrating jazz traditions through generations, and within a community. What’s more, in its most effective moments, the opening set I heard underscored Rudd’s deeply felt if undervalued place in jazz history, as a bridge between the visceral shouts of the ’60s avant-garde and the brawny technique of early jazz. Using Rudd’s original manuscripts, slide trumpeter Steven Bernstein and his Sexmob blasted through the trombonist’s “Rosmosis,” off the New York Art Quartet’s epochal 1965 self-titled album. The results were way meta—one great brass/sax hookup, Bernstein and alto player Briggan Krauss, saluting another, Rudd and John Tchicai, who personalized a language built by Ornette Coleman and Don Cherry. Another evocation of those heady ’60s, Rudd’s longtime compatriot Archie Shepp, joined the party. In a too-rare Stateside appearance, Shepp, now 80, blew tenor with a trademarked earthiness; his phrasing and tone and vibrato frayed in all the right places, like a blues guitarist overworking an old tube amp. He sang a good deal, too, with similarly warm erudition, on Strayhorn’s “My Little Brown Book” and Ellington’s “Don’t Get Around Much Anymore.” Other performances seemed designed to delight (the Bernstein-led all-star Trombone Tribe, NRBQ pianist Terry Adams), tug at heartstrings (vocalist Heather Masse, with superb work by guitarist Rolf Sturm) or, in the case of the terrific singer Fay Victor’s “Goodbye Pork Pie Hat,” both. That standard, off Rudd and Victor’s recent album, Embrace, was arranged as a midtempo groover, with expert filigree from pianist Lafayette Harris and just enough room to imagine Rudd’s contributions on trombone. Next year.